PARK CITY, Utah – The sounds of jack hammers will echo through the the hills of the mountain town of Park City, Utah as the 19th century mining town turned ski resort celebrates its past on Miners’ Day on Monday, September 4. 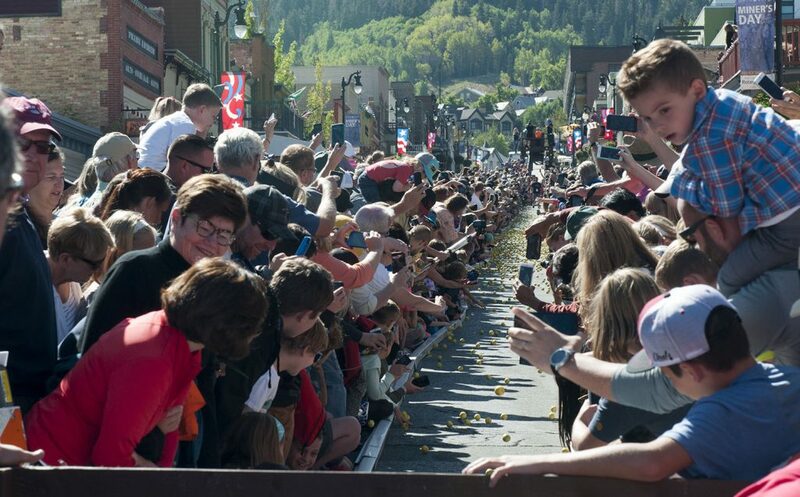 The day long festival will feature a parade, Miners’ Day 5k run, skateboard jam, an exciting mining skills competition, fun in City Park plus the annual Running of the Balls on Park City’s historic Main Street. Miners’ Day is produced annually by the Park City Rotary Club, with proceeds benefitting community non-profits. Known as Labor Day elsewhere, Miners’ Day has its origins during the 19th century mining boom in the now world renowned ski resort town of Park City. In its heyday, Park City was one of the world’s leading producers of silver. The mining heritage is center stage each year at Miners’ Day with the popular mucking and drilling competition where modern day miners keep alive the traditions of their predecessors. Miners’ Day features all day fun in the resort town of Park City. It kicks off with breakfast in City Park at 7:30 a.m., just in time for the start of the Miners’ Day 5k run at 8:00 a.m. Main Street becomes the focal point with the annual Running of the Balls at 10:45 a.m. Get there early to buy your balls for an opportunity to win prizes! A fundraiser for the Park City Rotary Club and local non-profits, nearly 10,000 balls made the trip down Main Street last year. Balls are available in advance from any Rotarian or at the Park Silly Sunday Market. The Miner’s Day Parade at 11:00 a.m. takes pride in being just a little bit different than your typical parade with community organizations having a little fun with their funky floats. Food, fun and music are on tap all afternoon in City Park, with live music courtesy of Mountain Town Music, food from Kumbayah Kitchens, Olympic-like Kids Games at 12:30 p.m. plus beer on tap. A Skateboard Bowl Jam wraps up the afternoon beginning at 3:00 p.m. This year’s musical lineup features two of the region’s most popular bands. Rumba Libre will kickoff the afternoon followed by Park City’s own legendary Motherlode Canyon Band. 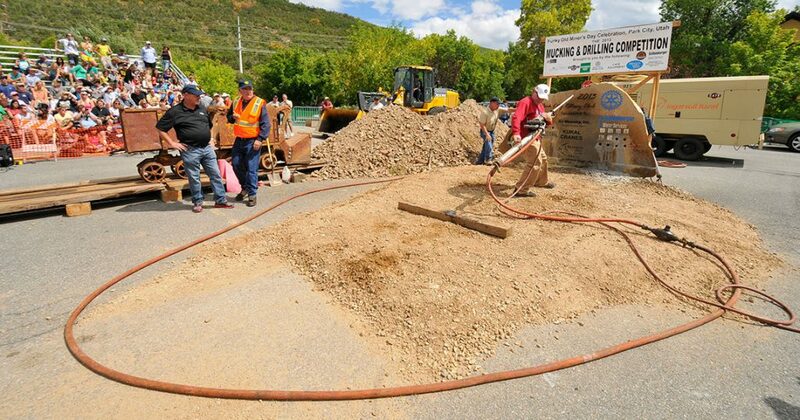 One of the highlights of Miners’ Day is the Mucking and Drilling Competition. Bleachers fill early in the parking lot across from the library. Miners’ from around the intermountain west challenge each other drilling target holes in a rock, then put their skills to test running a mucking machine, loading mine tailings into a rail bucket as quickly as possible. It’s high energy and sweat, watching old and new miners strut their stuff. To get the latest update on Miners’ Day, visit www.parkcityminersday.org. The Park City Rotary Club is a community service organization comprised of community and business leaders who engage in activities to give back to Park City and the global community. Founded in 1980, the club has around 100 members and is a part of Rotary International. Among its many activities is the management of Park City’s annual Miners’ Day festival every Labor Day. The club organizes a wide range of annual fundraisers benefiting local causes and international outreach programs, granting over $1 million since its inception. Long known as one of the most innovative and fun clubs in Utah, Park City Rotary Club was named Utah Rotary Club of the Year in 2014. To truly enjoy Park City Miners’ Day with your family and friends, have a plan for parking and transportation. Take advantage of wide open parking at Park City High School with free transportation downtown. If you’re meeting up with friends, consider carpooling with free parking at Richardson Flats near SR248 and US40 (parking but no transit). Also consider riding your bike. 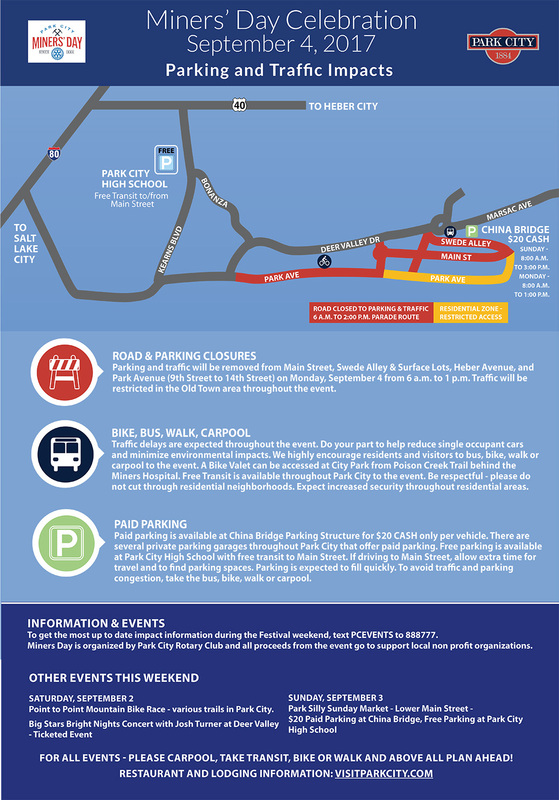 Park City Municipal has provided this handy guide to parking and transportation, including road closures surrounding the parade. 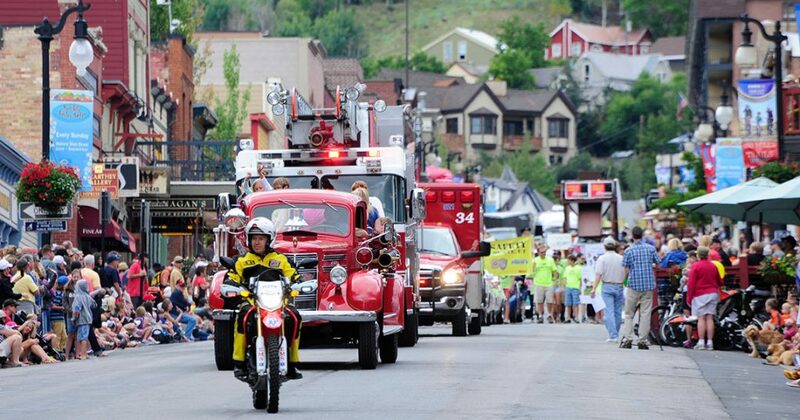 Entries for Park City’s annual Miners’ Day Parade on Monday, Sept. 4 are now open. It will be the 120th running of the community’s historic parade down Main Street to City Park. It’s all a part of the Park City Rotary Club’s Miners’ Day Festival. The parade is open to all from politicians to non-profits, commercial companies to individuals – even dogs! Parade entry fees range from free for individuals up to $100 for companies with 11 or more employees. Non-profit or non-commercial organizations are free. Entries are accepted up to Friday, Sept. 1. Simply complete the online Miners’ Day Parade Registration form. Click here to download and print the Miners’ Day Parade Registration Form. It’s a thrill to be in the Park City Miners’ Day parade, walking down historic Main Street to the cheers of your friends and fellow Parkites. To help keep the parade close to on schedule and to best enjoy your experience, please be familiar with the protocols for the parade. Be there on time and be ready to roll! On behalf of the PARK CITY ROTARY CLUB, we are excited to have you and your friends and family join in this year’s MINER’S DAY PARADE and FESTIVITIES. Please find the following guidelines which must be followed for a safe and fun experience for all. 2. Judging will begin promptly at 10:30. We are unable to judge entries that are not present and ready. 3. Arrival and drop off. No vehicle will be permitted on Swede Alley that is not the parade entry itself. No double parking please! Entries only may access Swede Alley via one lane access off of Deer Valley Drive. This will be a designated bus lane. Again parade entries only. Participants who do not arrive on the float vehicle may be dropped at the top of China Bridge to walk to Swede Alley. There is no vehicle entry to Swede from China Bridge. Participants may also take the bus from the free parking at the Park City High School to the transit center for drop off. 4. Parking can be done in China Bridge from the Marsac side. Arrive early as parking is limited. Again, there is no entry to or from China Bridge from Swede Alley. China Bridge may only be entered or exited from Marsac. 5. Check-in for your parade position at the Parade Official’s table located on Swede Alley to receive a number designation for your entry. Park within that number designation on the street. Each entry is spaced based on the description given on their submitted application. DO NOT OVERLAP OTHER ENTRY NUMBERS!! If you did not specify length or size on your application and are overlapping another entry, contact Heidi Hewitt 435-901-4068 to adjust your space before parade day. On parade day see Heidi at the top of Main and Swede immediately upon check in. 6. Tape your parade entry number to the middle of your car, float, entry or corner of banner for the ease of announcers and judges. Announcing occurs from the Deck at 505 Main Street and again at the 9th avenue turn. 8. The parade route is down Main Street, turning left on 9th Avenue, then right onto Park Avenue. Participants are not permitted to stop for performances as gaps in the parade floats cause hazards. Please keep moving to avoid pile ups and gaps. The parade ends on Park Avenue past the entrance to City Park. All parade entries MUST continue down Park Avenue. You can NOT enter City Park. You may drop off at 7-11 and will only be allowed 30 seconds to disembark. Please know where and how your participants are meeting up with their friends and family members. Those who do not disembark the entry will be required to sit down on their floats and slowly and cautiously ride to where they are going to fully disembark. 9. NO alcohol allowed, either in or on parade floats and entries. 11. NO water devices such as squirt guns, water pistols, water balloons will be allowed, either in or on parade entries. 12. Children MUST be under adult supervision at all times. Children and Adults should not be in front of their moving vehicle entry at any time. 13. Please pick-up all trash created by you on Swede Alley, the parade route and in the area you tear-down your float/entry. Thanks to our broad range of Park City Rotary Club friends, the club had a record year with Running of the Balls! All the proceeds will go to support our many community causes. It was a fun and festive atmosphere when Trevor and Canice set the balls in motion. Thousands lined the tracks as the Park City High School Interact Club students paved the way for the yellow balls. A big thanks to Big Budah from Fox 13 in Salt Lake City for full coverage leading up to the event all morning long. If you won a Running of the Balls prize, the Park City Rotary Club will reach out to you this week to arrange pickup or delivery. Thanks to our many prize partners listed below. If you visit any of them, please give them a thank you for being a part of the Park City Rotary Club’s Running of the Balls.